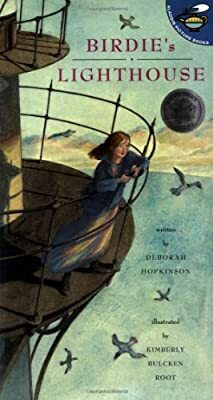 Author: Hopkinson, Deborah Set In . . . The sea is never still. Sometimes it roars so load that it drowns our voices. Mama says there hasn't been a storm this fierce since the night I was born. She thinks it too dangerous for me to go to the tower again. Yet what else can I do? I'm the lightkeeper now. On the tiny lighthouse island that is her family's new home, Birdie faithfully keeps a journal. She writes down everthing: the change of seasons, the rhythms of the sea, and all that her father, the lightkeeper, is teaching her. But then one stormy night, her father is taken ill. And only Birdie knows how to keep the lighthouse's strong beam running. Will she be brave enough to guide the boats safely into harbor?